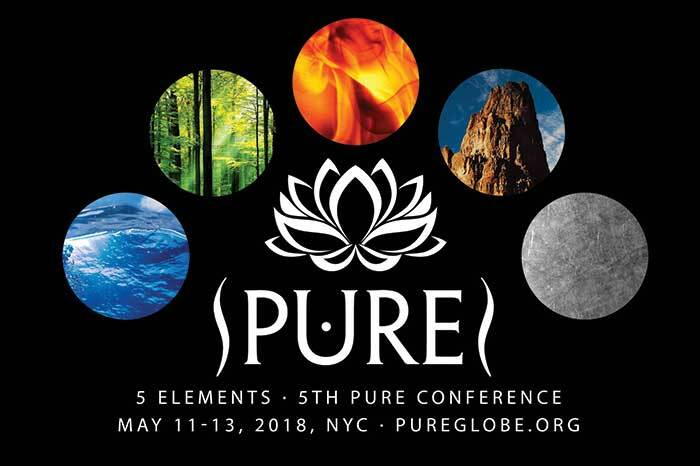 WHAT: The 2018 5 Elements PURE Conference explores the 5 elements of water, wood, fire, earth and metal through workshops, panel discussions, a theatrical dance show and dance offering to the planet May 11-13th, 2018 in New York, NY. 2.00-3.00pm Panel: Living Sustainably on Planet Earth w Shai Naides + Miryam Shemwell. Moderated by Myra Krien. 5.30-7.00pm Procession and Tour of Central Park with Ranger Rob. Please note that the tour of the Met with Nancy Eder is included in the Full Conference and Friday pass however entry into the Met Museum is an extra $25. NY residents can pay as you wish. History of the Five Elements. Introduction of the Earth and Wood Element through Belly dance! Titanya created Five Element Belly dance in 1996, while teaching with her mother holistic health pioneer, Donna Eden. Incorporating the Chinese Five Element system into her Belly dance workshops, she and her sister, Dondi, have taught these popular workshops empowering women in their own divine spirit and movement, annually. Through storytelling and visualization, history and culture, with the ancient art of Belly dance, you begin to know yourself even more as a dancer, when you connect the framework of the Chinese Five Elements. We will dance with our sisters by embracing our Earth movements. We will meet the opposite of Earth, our Wood self, that establishes boundaries in our life through the drum solo. Every day people are confronted with images of the 'perfect' body that just don't reflect the diverse society we live in. These unrealistic images set an impossible standard, potentially damaging self esteem and crushing confidence. How can we build our resilience and shift the paradigm to celebrate the many shapes, sizes, colors that beauty comes in? Introduction of the Water, Fire and Metal Elements. We end with an Elemental Ceremony of Movement. We will connect through the Water and our emotional selves with Veil and Taxim dance. We will touch into our Fire sides, bonding back to our sisters with Gypsy dancing of exuberant joy. Then, we will come back to a calm outer presence and move into the Metal element. In my sessions, you will find that you connect more to one element than another and in this way, you will meet your own strengths while building up the elements in you that are less dominant. You will get to know yourself intimately as well as the relationships you cherish, as Titanya explains the elements and how they work and what drives each of us forward in life. This collaborative hands-on somatic interactive workshop dives into the Chinese five element model (touch for health) of Meridian/Muscular/organ/psychological/emotional interconnectedness. In addition there will be self care techniques and practical exercises that will translate into anyones life. There will also be discussions on how to cultivate an allied relationship with the unconscious shadow. This information is a powerful compliment with the expanding transformational bodywork Mark does with people. It assists participants in integrating and grounding the major shifts that occur in the private bodywork sessions. Learn about the archetypes of each chakra and the alchemy of mind, body and spirit. This workshop is a powerful, interactive exploration of the body – your body and the vast universe of emotions within each and every one of us. Feelings buried alive never die and when feelings aren’t felt and honored they get stuck in the body. This “stuck-ness” can turn into aches and pains and then if not dealt with can manifest into serious illness. All the information will be presented in an easy and digestible fashion with humor and relevance. Anyone is welcome to attend and no prior experience is needed – all you need is a body! Learn part 1 of the procession dance celebrating the 5 elements. Break through the limits we impose on our own potential to transform our lives and manifest our dreams. Antonina Canal is a healer, dancer, author of "Awakening the Goddess" and "Yes, You Can and It's Easy", plus business coach to companies such as Toyota, Masglo and Mary Kay. The workshop includes lecture and movement. 2-3pm Panel Discussion: Living Sustainably on Planet Earth with Shai Naides and Miryam Shemwell. Moderated by Myra Krien. What everyday actions make the biggest difference to our ecological footprint? What can we do to help shift the system and come together to drive change? Learn part 2 of the procession dance celebrating the 5 elements. Dance and be led on a personal tour by Ranger Rob through Central Park along the Harlem Meer into the Northwoods to see secret waterfalls. Dr. Gabrielle Francis has been practicing natural medicine for more than thirty years. She is a Naturopathic Doctor, Chiropractor, Acupuncturist, and Licensed Massage therapist. Dr. Francis currently practices in New York City as The Herban Alchemist. She also operates Backstage Alternative, which is her natural medicine road show that provides chiropractic, massage, acupuncture, nutrition and herbal remedies to performing artists on tour. Dr. Francis earned her doctorate in Chiropractic medicine at National College of Chiropractic in Chicago, IL. She received her degrees in Naturopathic Medicine and Acupuncture and Oriental medicine from Bastyr University in Seattle, WA. She completed a clinical residency for Acupuncture, Chinese Massage and Chinese Herbal Medicine at Chengdu Hospital for Traditional Chinese Medicine in China. She did a residency through Bastyr University at Biomedical Center Cancer Facility in Mexico where she learned the utilization of alternative medicines for cancer treatment. She received a certification in drug and alcohol detoxification using acupuncture at Lincoln Hospital in Bronx, NY. Miryam Shemwell, a French-American born in France and living in New York City since 2015, is currently working at GrowNYC and volunteering at Sure We Can. After a first career in translation, she went back to university to study Sustainable Development & Environmental Protection in Montreal to combine her lifelong personal values with a more meaningful career. Her favorite motto is “Reduce, Reuse, Recycle” and she’s passionate about inspiring people to care for the environment and change their consumption habits. She believes that leading by example is the first step to system change, and she’s particularly interested in the zero-waste living movement growing globally and in NYC. The mission of SEEDs is to mentor young women in order to create healthy and strong individuals who are socially and fiscallly responsible to them-selves and their community. This is accomplished trhough the vehicle of dance, specifacally American Tribal Style dance, talking circles, journal writing and presentations. They are taught the elements of American Tribal Style dance, a rich diverse artistic, cultural dance form that spans the regions of India, the Middle East, North Africa and Spain, and its expression through the varied and complex music of these same cultures. The girls participate in talking circles and journal writing during which they discuss issues affecting them. Each girl indentifies a personal goal that she would like to achieve during the course of the program. Guest speakers cover a wide range of topics from nutrition and body awareness to financial education. Many successful women of various fields that are of particular interest to the girls address the girls each week. There are four Student Salons (student performances) each session. Entrance into the program does not depend on demonstrated talen, standard beauty, or ability to pay the fees the program would require. Nancy Eder holds a B.A. from New York University, where she majored in the History of Fine Arts and minored in East Asian Studies. Her M.A. is from the Institute of Fine Arts, New York University, where she concentrated in Chinese Art History. She completed the course work for her Ph.D. at the Ohio State University, where she majored in South Asian Art History and minored in Buddhist Art and Contemporary Art/Theory and Criticism. Starting in August 2006, Ms. Eder is an Adjunct Instructor in the History of Art Department at the Fashion Institute of Technology, where she teaches East Asian Art and Civilization as well as the Art and Civilization of India. She also was an Adjunct Instructor at the City College of New York from August 1999 through December 2009, teaching Western Art History surveys, Indian and Southeast Asia art history as well as the Art of China and Japan. Starting in March 2000, Ms. Eder is a Contractual Lecturer in the Education Department of the Metropolitan Museum of Art, where she gives tours for Adult Groups, presents Gallery Talks and also teaches for Family Programs. Shai Naides, a British national, born in Israel and raised in Spain, is currently working with a United Nations agency in New York to explore how people power can contribute and scale impact. Shai studied Environmental Sciences in Barcelona where he first learnt about social and environmental activism in its multiple forms. He served as Greenpeace Southeast Asia’s Engagement Director from 2014 to 2017, for which he was based in Bangkok. Involved in the organization for a decade, he had multiple roles and worked on campaigns of global significance, such as Greenpeace’s ‘Save The Arctic’ campaign. It's from these experiences that he draws insights and tips for bridging global strategies with local realities through mobilization and people-centered theories of change. All her life, Titanya has studied many forms of Movement and Dance as well as being a lifelong student in the Esoteric and Healing arts. She began Belly dance in the early 80’s and before that, she was a professional Polynesian dancer since the age of 9, as well as studying different types of dancing including traditional dance and world dancing. She has self-researched the sacred connections to movement as a healing force and so, she uses a spiritual approach in all her teachings. Titanya created Five Element Belly dance in 1996, while teaching with her mother holistic health pioneer, Donna Eden. Incorporating the Chinese Five Element system into her Belly dance workshops, she and her sister, Dondi, have taught these popular workshops empowering women in their own divine spirit and movement, annually. Through storytelling and visualization, history and culture, with the ancient art of Belly dance, you begin to know yourself even more as a dancer, when you connect the framework of the Chinese Five Elements. Titanya has been called “The Story Dancer”, as she is a professional Storyteller and Sacred Dancer who uses dance and cultural stories of strong Goddesses and Women to connect to her audiences.